The woman responsible for the Sbarro Pizza bombing now hosts a talk show on "Quds TV"
A few words about Ahlam Tamimi, who was recently released as part of the Gilad Shalit swap. On July 30, 2001, Tamimi, who was 20 years old, placed a bomb built into a beer can in a Jerusalem supermarket. The can was packed with explosive material plus rivets to serve as shrapnel — a home-made grenade. In order to avoid detection by security guards, she changed her clothes to look like a tourist, wearing a short top and pants. As she entered the store she pretended to be having a telephone conversation in English so that her handbag was not searched. When the accused reached her home, she sent a message from her cellular phone to Mahmoud Daghlas [who provided the bomb] in which she expressed sadness that in the attack which she had carried out no-one had been injured, and apologized for it. Because the explosion of the beer can had not caused any injuries, the accused told Mahmoud Daghlas that she demanded the devices be checked. The accused also said that if the results of attacks would be like this attack, devoid of injured persons, she would refuse to place further devices. Her next operation was more ‘successful’. She selected the Sbarro Pizza restaurant as its site. On August 9, 2001, she brought a bomb built into a guitar by Hamas bomb-maker Abdallah Barghouti (who is still in an Israeli jail, although his release was also demanded as part of the Shalit deal) to suicide bomber Izz-a-din al-Masry. She took al-Masry to the target in a taxi, gave him his final instructions, and left the scene. Al-Masry’s explosion ended the lives of 16 people, including 8 children. For this she received 16 life sentences, one for each victim. She always insisted that she had no regrets, and would do it again if she had the opportunity. It is chilling to us to watch her smile as she is told that she murdered not 3 children, but 8. But it is important to understand that this woman is not a psychopath. She is quite simply convinced of the justness, indeed, the divine righteousness, of her cause. Not only is she not a deviant psychologically, she is not one sociologically. One of the conditions of her release was that she would be exiled to Jordan, where she was treated to a hero’s welcome. 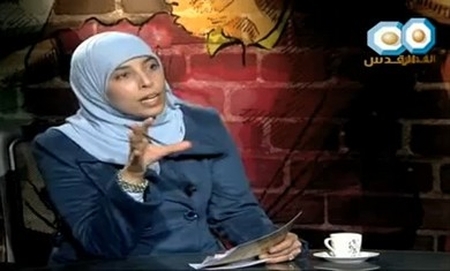 She now hosts a TV talk show concerned with the plight of the remaining Palestinian Arab prisoners in Israel. Ahlam Tamimi is the true face of the Palestinian Cause. This entry was posted on Friday, March 2nd, 2012 at 4:14 pm and is filed under General. You can follow any responses to this entry through the RSS 2.0 feed. Both comments and pings are currently closed.